NAVA, or North Atlantic Videogame Aficionados, will be holding their monthly meeting on May 31st at Digital Press. I'm probably going to go, as I have been getting emails for months about their meetins but I have been too busy with school to make an appearance. I'll post the details of the last meeting (as a received through the email) so you can get a vague idea of what happens at these "meetings." - An Intellivision sat side-by-side with an XBox 360. For about an hour the Intellivision got more attention. - A Gold Nintendo World Championship cartridge was sold from one attendee to another. Price: $12,000. - The band blasted Ballroom Blitz. Babies bawled. - Mario Bros were replaced by Space Fury Bros and a tournament ensued. - Captain S and Little Miss Gamer from PBC Productions made guest appearances. - Shelley Duvall's "It's a Bird's Life" was picked up and considered. Basically, it is a big get-together of gamers playing whatever they feel like from 12-12. Screwattack people will be there, as well as members from PBC productions. It's taking place at Digital Press in Clifton NJ. I'll probably be going this week, so if nothing else I will post some photos after to show you losers what you all missed. I'm a woman who loves her video games. I'm also pretty much a nerd for all that is nerdy: MST3K/Riff Trax, Star Wars, Anime/Manga, Kevin Smith, X-men Comics, and of course all things video games. Someday, I would look to get paid to write for and/or about video games. I'm awesome, so it'll will probably happen. I have a strong hatred for the Atlantic Ocean. Yoshi BBFs forever: Me, Suff0cat, Wardrox, and ScottyG. Preferred games are RPGs and puzzle games. I like the occasional FPS (Timesplitters: FuturePerfect being my favorite) and some racing (Burnout Reveeeeenge). That link is to some of my photography/photoshop art done for Project 365. If you don't know what Project 365 is, GOOGLE IT DUH. 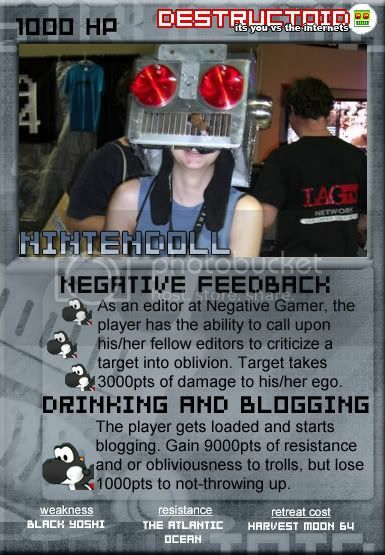 I also write a bit for Negative Gamer.